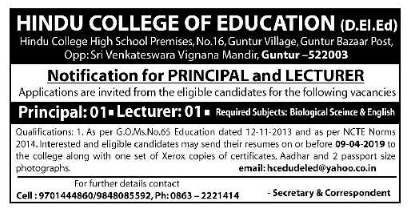 Hindu College of Education, Guntur has advertised in the EENADU newspaper for recruitment of Lecturers / Principal jobs vacancies. Interested and eligible job aspirants are requested to apply on or before 09th April 2019. Check out further more details below. About College: 1935 is a historic year in the annals of the ever-growing town, Guntur, which occupies a significant place in Andhra Pradesh. It was in the year 1935 that the Hindu College was started with an aim to serve the community through education by employing time-tested methods of teaching and raising the moral standards of the student community. It was due to the untiring efforts of a group of dedicated men who illustrated the truth that sincerity and teamwork would lead to success in any field. The college has achieved the great heights that its founding fathers envisaged, through a constant and consistent endeavor to give quality education to the student community. The college has been rendering yeoman services to this cause for over 71 years. How to Apply: Interested and eligible candidates are requested to send CV along with copies of certificates, copy of aadhaar card, copy of PAN card and 02 recent passport size photos to the postal address mentioned below or email address.